Following on the success of our Underwater Tribe/NAD Lembeh Resort Fun Weeks over the past few years, we will once again host a 7 night/17 dive package in 2016 at the best photo resort in the Lembeh Strait, NAD Lembeh Resort. We will be limiting the number of divers who will be able to attend this workshop in order to maximize everyone’s personal time with the instructors both underwater and in the resort. One of the highlights of an Underwater Tribe workshop is that the instructors don’t bring their cameras with them underwater, instead we spend time one on one with each participant helping them to compose their photos, aim their strobes, and anything else that helps them make the most of their time underwater. Arrival is planned on the afternoon of the 30th with a “Meet and Greet” plus Introduction planned for the evening where everyone will get a chance to get to know one another. The diving will start on the 31st with three dives planned per day for the 31st – 4th and the final two dives on the morning of the 5th for a total of 7 nights and 17 dives. Each day will consist of two morning dives followed by lunch, a short lecture, an afternoon dive, and then evening critiquing sessions, dinner, and after dinner presentations by the instructors. On the 5th we will have a bit of a party with a final “End of the Week” slideshow of everyone’s best shots. Although macro and critter photography are the highlights of diving in Lembeh Strait, there are also wide-angle photography opportunities available and we will be discussing several wide-angle photography techniques during the week, but the main focus will be on critter photography. Topics that will be discussed include: “The Basics of Lighting”, “Pursuing Portraits”, “Close Focus Wide Angle”, “Black and Blue Macro Backgrounds”, “Composition” as well as the effective use of Lightroom as well as other subjects as time provides. Students will all receive PDF copies of all of the presentations to take home. We have timed the workshop to coincide with Silk Air flights that arrive and depart on the 30th and 6th respectively via Singapore but connections are also available for from Jakarta and Bali to Manado with Garuda and other domestic airlines. As with any form of class or workshop, choosing the right instructors for an underwater photography workshop is very important! The key is having mentors/instructors who will work with you in a hands on manner both in the classroom as well as underwater. The hallmark of an Underwater Tribe Photo Fun Week is that none of the instructors are there to take photos underwater, they are there to help you improve your photographs! Therefore, instead of carrying a camera all of the Underwater Tribe mentors carry slates underwater and help the students on every dive with shot selection, strobe positioning, settings, and also help guide them into interesting new ideas for shooting subjects in a different way. Mike, Luca, and Doug are the three instructors involved with the Underwater Tribe, for this workshop there will be a minimum of two instructors to provide the greatest level of service possible and maximize the learning opportunities for attendees. 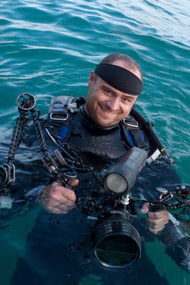 Mike Veitch – Mike is a long time photo and video pro who has been teaching underwater photography for more than a decade. With a client list of many of today’s top underwater photographers, Mike’s knowledge and hands on teaching style has helped improve the photography skills of hundreds of people worldwide. Mike is regularly published in diving magazines worldwide and his awards include winning a major category in the prestigious BBC Wildlife Photographer of the Year competition. Luca Vaime – Luca is the co-founder of the Underwater Tribe and the Bali Academy of Underwater Photography and has been working full time in the diving industry for 15 years. A scuba instructor with hundreds of students to his credit, Luca has been teaching photography and video to eager divers for many years. His easy going style and outgoing personality allow him to create a great rapport with workshop attendees. 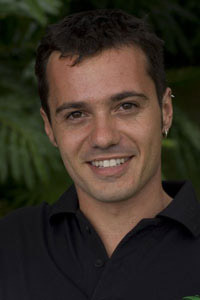 Luca has contributed photos to publications worldwide and his boundless energy is contagious throughout our workshops. Doug Sloss – Doug is an underwater and landscape photographer, photography educator and digital image developing enthusiast based just outside Denver, Colorado. A long time photo pro and dive instructor in Palau, Micronesia, his award winning photography has appeared in numerous diving magazines and books worldwide. His passion for teaching photography led to a successful series of DVD tutorials he’s created that help underwater and topside shooters of all levels professionally post-process their images with Adobe Photoshop and Lightroom.